Samuel Jackson, voice of The Incredibles' Frozone, would love to reprise the role in the upcoming sequel. Following the news of Disney's planned sequel to the 2004 hit The Incredibles, Samuel L. Jackson teased the return of minor, but well-loved, character Frozone. Jackson would reprise his role as the superhero and old friend of Mr. Incredible. "Every time I run into Brad [Bird, The Incredibles 2 director], he always tells me Frozone is part of what's going on, so I have to believe that," Jackson said. 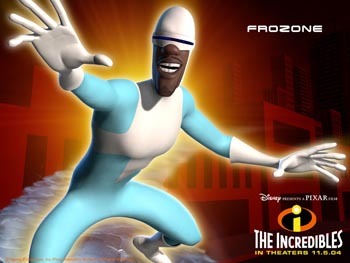 Frozone is the superhero alter ego of Lucius Best, good friend of the Incredibles family. He can freeze water and moisture in the air to manipulate ice. As a side character he had no large parts in the first Incredibles movie, but he comes to his friends' aid in the end (after finding his misplaced supersuit). "I guess they could be the Incredibles without Frozone," Jackson said, "but I think Frozone would be a wonderful addition to what's already there." Jackson noted that he's most excited about the growth of Jack-Jack, who was merely a toddler in The Incredibles. If Frozone is a part of The Incredibles 2, he would likely be in it as a minor character again. However, his inclusion would be well worth it if there's another scene like "Where is my supersuit?" from the first. Pixar is not producing any films for theatrical release this year. Next year it will release Inside Out, and 2016 will see Finding Nemo sequel, Finding Dory. The Incredibles 2 will likely come out after this time. Disney and Pixar are also working on Cars 3.